*The Maritime Museum will carry out repair works from 19 February and will be temporarily closed to the public until further notice. If the history of Macao is really connected to the sea, there is no better place for the Maritime Museum, than the Square of the Barra Pagoda, dedicated to the Taoist goddess "A-MA", the protector of fishermen, and also believed to be the place where the Portuguese first landed. The precise spot is where the Maritime Museum is located, the building is in the shape of a sailing ship anchored in the waters of the Inner Harbour. On the ground floor the visitor can see the traditions and the way of life of the fishermen in Macao and South China: there are several types of ships, instruments and methods of fishing, different varieties of fish and shellfish living in these waters and even a copy of a fisherman's house, where the whole family can be seen sharing the tasks which precede or follow fishing activities. 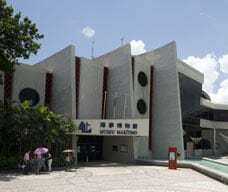 The visitor should note the "Little A-Ma Theatre" which tells the legend of this Goddess in Cantonese, Mandarin, Portuguese and English. 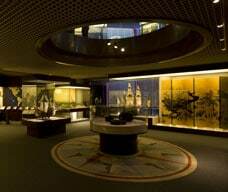 The second floor is dedicated to Maritime Technology and Transport and it illustrates the way Macao has been connected to the sea. Several traditional tools can be observed along side models of the latest ships, for example the jetfoils that nowadays link Macao to Hong Kong. Special attention should be given to the monitor that enables the visitor to learn about Macao's weather, particularly during the typhoon season when the formation of these tropical storms can be observed and tracked. In addition, visitors can view a sky over the Northern Hemisphere, demonstrating the importance of astronomy in navigation. Through interactions a visitor can find different constellations, including the one representing him/herself. On the way out the visitor will cross a gallery of aquariums showing a riverbed, the harbour waters, a coral reef and last of all the seabed with the remains if an ancient shipwreck. Outside of the museum the visitor will find several real size exhibits, among which a dragon-boat similar to those raced during the Dragon Boat Festival. Opening hours: From 10 a.m. to 6 p.m. (Last admission at 5:30 p.m.). Closed on Tuesdays. Remarks: The Museum includes a nice esplanade by the river with a bar, open from 10 a.m. to 6 p.m. (Closed on Tuesdays). 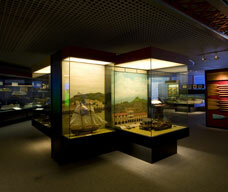 On the ground floor of the Museum there is a shop selling souvenirs and books about the city of Macao, maps, etc.